Gossen is a German company that, along with Sekonic, made about 10,000 different meters and gave them similar names. Gossen loves the words "Six" and "Luna," so there are all kinds of varieties of "Luna" meters and "Six" meters, and yes, there's a LunaSix in there somewhere (it's called the Luna Pro in America). 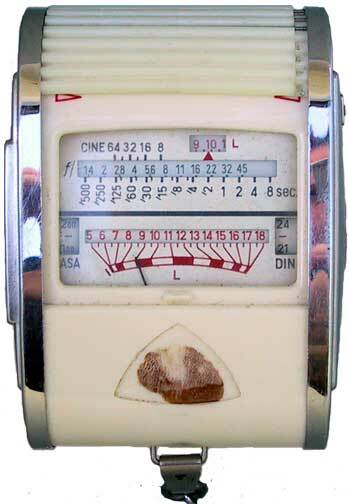 I didn't know what this thing was until I found it on the internet earlier this afternoon as I was researching another meter. I got it in a box of junk from a camera swap somewhere (I love buying boxes of misc. old camera accessories and rummaging through them). What drew me to it was that sliding corrugated screen that rolls back to uncover the photocell. But other than that I knew nothing about it. They made at least three units that are cosmetically almost identical: this, the Sixton and the Sixtomat. There may be even more. The only reason I know (and even then...) that this is a Sixtry is that the shape of the emblem in the front matches. Mine (and I've seen others with the same problem) is missing the emblem on both the front and back; I guess Gossen's glue at that time wasn't very good. The Sixtry came out around the time that the Germans were pushing the Exposure Value System of measuring light and setting cameras. The idea was the meter would give you an EV number (a whole number, typically between 1 and 19, but negative numbers were possible) and you'd set the camera shutter and lens to that EV. The camera lens then automatically had all the shutter/aperture combinations locked in, so adjusting one automatically adjusted the other. I have a couple of Voigtländers that do this, and Rollei and even Hasselblad offered this feature, but the Japanese didn't like it (particularly since it worked well with leaf-shutter cameras where the shutter and the aperture rings were close and could be mechanically coupled together. SLRs with focal plane shutters and interchangable lenses didn't. Ultimately, automation and on-camera light meters took all this over). Anyway, the Sixtry ties itself into the EV system. You set the film speed with a dial on the side and it brings up the EV scale the needle uses. If you're using EVS then it's direct read, otherwise you have to use a thumbwheel to dial in the EV number on a calculator rule to get your shutter/aperture combo. Two unique features to this meter that make it interesting. One is the little corregated roll-up door that covers the face and selenium cell. If you roll the door all the way back and expose the cell, it's a reflected-light averaging meter. But if you roll the door up to expose the face but leave the cell covered, it's becomes an incident meter. The other feature is an oddball: a sort of color temperature meter that uses a chart. You flip the side door open and look at the chart; there are blue and red steps and try to see which look stronger, and this tells you the color balance of the light. A chart on the emblem on the rear (which is missing on mine) suggests filter combinations to use to balance the light to the film.